So, do you have your next story, ready to be written? muahahaha My grandmother had something similar and let me tell you, that baby was hard to type on. You had to have some major finger muscles to press the keys down...forget about words per minute! 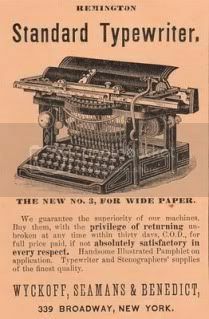 When I was about thirteen, or so, I actually taught myself to type on a non-electric typewriter... it was shortly after that, the first electric typewriter came out... I think. Whatever... it was the first one I knew about it. I saved my pennies for that baby.